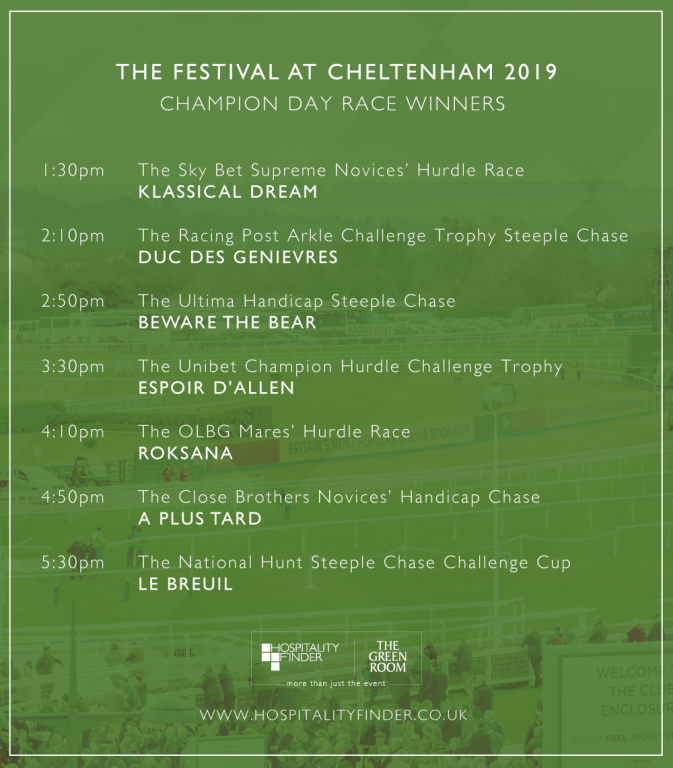 Catch up on all the horse racing action from The Festival 2019 at Cheltenham including highlights, winners and an insight into what The Green Room can offer you and your guests. 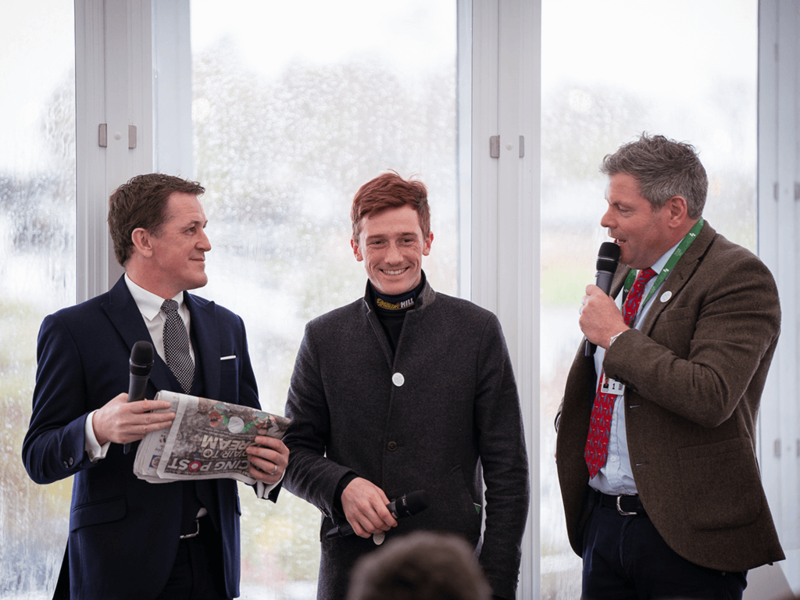 Throughout the week we held Q&A’s with former jockey Sir AP McCoy and current jockey Sam Twiston-Davies in The Green Room, where they shared their tips and exclusive content for our VIP guests. Joining them was racing expert Emma Spencer, who also provided our VIP guests with tipster information on who they should be looking out for. And of course, Mark Durden-Smith, our one and only host, was there to compere the four days. 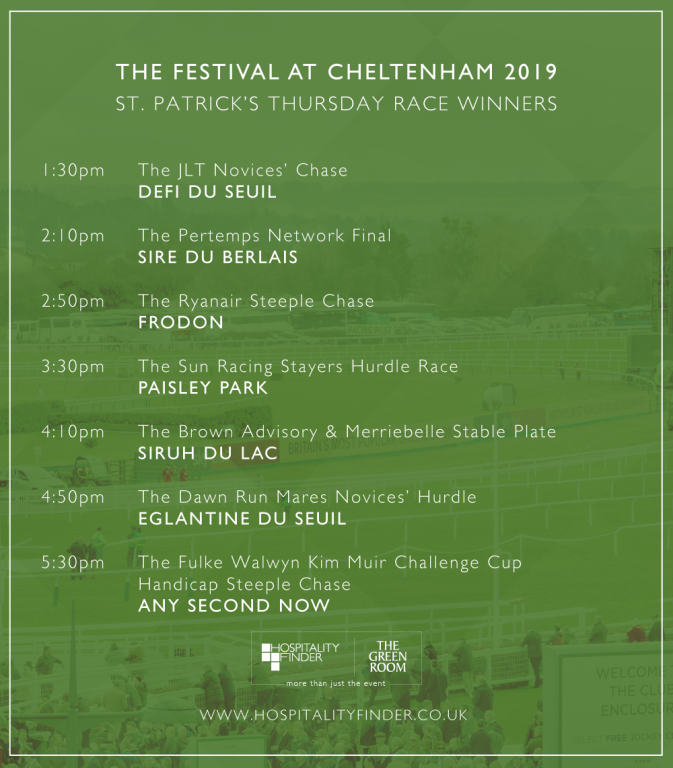 This year The Festival attracted record breaking crowds, around 266,779 attended Cheltenham during the week in 2019. Although the weather wasn’t the best with all the rain throughout the day, it didn’t stop the guests inside The Green Room having a great time. As our guests arrived in The Green Room, they were welcomed with a drinks reception before they made their way to their seats ready for Mark to start the day. During the morning, guests were able to mingle and take photos with the horse racing legend, Sir AP McCoy OBE. 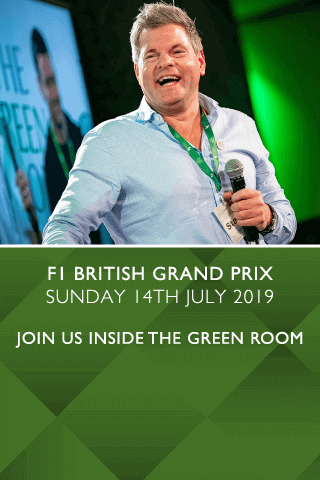 Mark took the opportunity bring Friend of The Green Room, impressionist and comedian, Rory Bremner onto the stage with him where he entertained guests with his Donald Trump impression. But Bremner wasn’t the only celebrity horse racing fan there on Champion Day. We were also joined by comedian Dom Joly, English former bronze Heptathlete medallist Kelly Sotherton, DIY SOS and I’m A Celebrity contestant Nick Knowles as well as Westlife member Brian McFadden, who recently took part in ITV’s Dancing on Ice. Before Sam Twiston-Davies had to leave The Green Room, to prepare for the first race of the day, he shared his thoughts on the races and how he had faith that his racing horse, Al Dancer, would do well. Guests were served their gourmet menu including Severn and Wye Smokehouse cured Chalk Stream trout for starter. Main included Yorkshire Landrace pork tenderloin and dauphinoise potatoes and for dessert Rhubarb and hibiscus crémeux, poached rhubarb, hibiscus gel and raspberry meringues! Plus a cheeseboard and tea/coffee. Opening day of The Festival attracted 66,632 which is up on 2018 by over 1,000 guests! Day 2 of the Cheltenham Festival saw an array of celebrity guests stop by the Green Room including DJ Seb Fontaine who is joining us at the Monaco GP later this year. Amongst the special guests were Flats and Shanks (David Flatman and Tom Shanklin), One half of the Weasley twins, James Phelps and golfing legend Lee Westwood. We even had a surprise visit from Love Island contestant, Frankie Foster. Our VIP guests were also joined by two former jockey’s Christian Williams and Sam Thomas. If you have us on Instagram, you would have seen many of our exclusive stories, including tips from presenter Gethin Jones along with our ambassador Lawrence Dallaglio celebrating his win! As usual The Festival doesn’t disappoint with the menu. For starter on Ladies' Day our guests enjoyed a Cotswold ham terrine and Parmesan panna cotta. Corn-fed Goosnargh chicken à la forestière and foraged mushroom cannelloni was served for the main. And dessert was a sublime passion fruit and white chocolate torte with textures of raspberry. It was another great day of racing at The Festival, with AP McCoy and Sam Twiston-davies sharing their inside horse racing knowledge with our VIP guests continuing the amazing atmosphere from Champion Day. 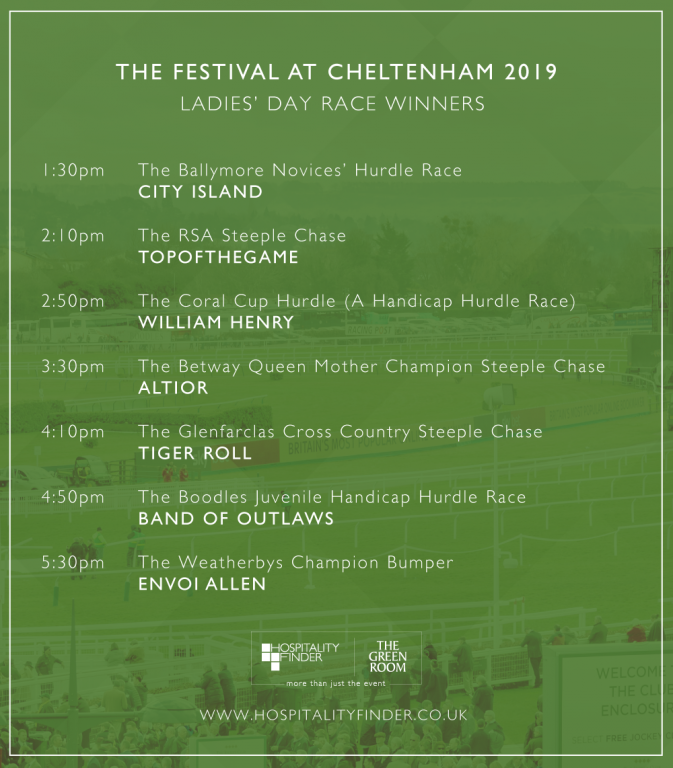 Ladies' Day reached a new record in 2019 with 58,959 attendees, the most since the meeting switched to a four-day format. Did you share Dallaglio's luck with any of these winners? Day 3 in The Green Room and the atmosphere was buzzing as described by Emma Spencer, mentioning that the horse to follow is Frodon and jockey Bryony Foster. It turned out that Emma was correct - Bryony was the first woman to ride a top-level Grade One winner over jumps at the meeting! Like the other days of The Festival, The Green Room attracted some familiar faces. Sir Kenny Dalglish, a former Scottish footballer and manager was just one of our celebrity guests. Welsh actor Julian Lewis Jones, former England Rugby player Austin Healey and Nicky Robinson, a welsh rugby player, also were in attendance. As guests arrived, they were treated to a glass of Champagne as they made their way to their seat before a day of entertainment with our horse racing experts. Guests enjoyed a four-course silver luncheon including Severn and Wye traditional gravlax, a Trio of Cotswold Lamb, Apple and mint with lemon and poppy seed sable and to finish a cheese board. The attendance was up 1,439 guests from 2018 reaching 67,821 and a new St Patricks Thurday record! The final day of The Festival, Gold Cup Day, is a celebration of one of the biggest races of the week! We have had a full-on week of racing in The Green Room and some guests have been there on all four days with us! We caught up with our celebrity guests in The Green Room to find out who they’re backing. Along with our ambassadors and fantastic host, joining our VIP guests in the facility was actor Ben Miller, TV Presenter Natalie Pinkham, Olympian Amy Williams and TV Presenter Diana Dougherty. Along with these famous faces we welcomed back Frankie Foster from Love Island who also brought fellow contestant Charlie Brake along with him. Singer Alfie Boe was also a guest inside The Green Room and he kindly sang Happy Birthday to our Events Co-ordinator. What a treat! Cheltenham Festival had a record breaking week with attendance figures being described as ‘four days of extraordinary’! Gold Cup Day saw71,816 horse racing fans flock to The Festival! 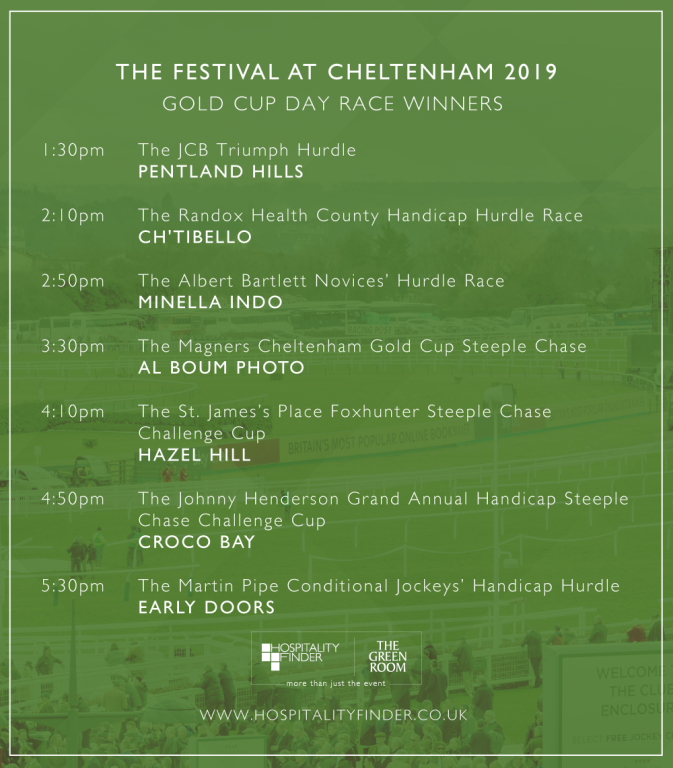 Here are the final winners for Gold Cup Day, did you back any winners this year? What a week of racing! VIP guests inside The Green Room had access to expertise you couldn't get anywhere else. Can you believe it's all over? We will be doing it all over again at the Cheltenham Festival 2020! Don't miss out, get in touch today to join us next year!